Commentary from a Tough Old Geezer Skier about senior skiing and Geezerhood. When I arrived at Cornell University in 1953 to continue my undergraduate studies I walked up Tower Road almost daily to attend classes in buildings on the upper campus. 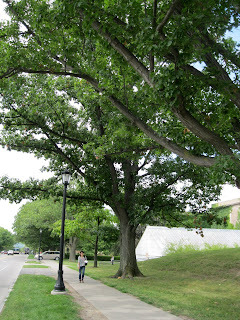 Each side of Tower Road was lined with relatively young oak trees perhaps six to eight inches in diameter. Over the last 58 years since I have observed their growth into magnificent giant oaks. A few days ago during a walk up Tower Road I became acutely aware of how these oak trees had survived the onslaught of weather, road salt and other abuses of their environment. These trees have become geezer oaks in a wide range of health and condition. And some have not survived at all. Perhaps these oaks are metaphorically like men moving through geezerhood. The oaks on the north side of Tower Road are sturdy, large and quite healthy. They are planted in good soil and are well pruned and still producing many acorns for the squirrels. The oaks on the south side of Tower Road have not fared so well. Auto parking under these trees on the south side has compacted the soil and contaminated it with road salt. These trees have stunted growth and often poor leaf and acorn production. Humans moving through geezerhood also exhibit differences in their quality of survival as a function of of the quality of their past and present environment. Geezers of the magnificent oak variety have had the good fortune of the environment of loving and supportive relationships, healthy habits and satisfying careers. Unfortunately some geezers have suffered both self inflicted bad choices and random misfortunes that have produced limited growth and abilities. The tattered oaks are their symbols. Just like the oaks on either side of Tower Road, we geezers are all survivors even if we might show differing appearance due to the ravages of time and life difficulties. Retired Cornell Professor Emeritus of Biological and Environmental Engineering. Husband of Nancy Rehkugler. Father/Stepfather of seven children and grandfather to 12 and great-grandfather to 5.